Kiko Milano Flawless Fusion Bronzer Powder is a bronzer that adheres well to the skin, making it possible to naturally and evenly contour your face. It's pleasantly silky to the touch. 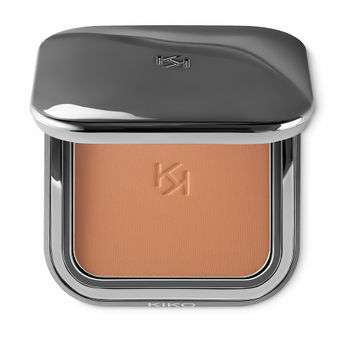 The bronzer comes in a modern compact with a gunmetal finish and the KK logo engraved on the cover. The case has a magnetic closure and an internal mirror. A luminous and even finish. Sculpted face makeup for accentuating your femininity. Your complexion will have an even look and a seemingly natural tan all day. Alternatively, you can also find many more products from the Kiko Milano Flawless Fusion Bronzer Powder range.